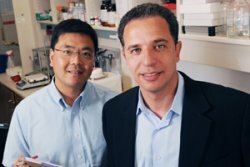 UT Southwestern Medical Center researchers have identified unique metabolic properties that allow a specific type of stem cell in the body to survive and replicate in low-oxygen environments. In a study published in the September issue of the journal Cell Stem Cell, investigators found that the low-oxygen microenvironments that ordinarily deprive and starve other kinds of cells are tolerated by a type of stem cell used as the primary material for bone-marrow transplantation. These cells, called hematopoietic stem cells, are found in marrow and can replicate quickly. Once transplanted, they eventually develop into blood and other types of cells. Their ability to self-renew before they transform into blood forms the basis of their usefulness for bone-marrow transplants. Dr. Sadek and his team sought to understand how hematopoietic cells regulate their metabolism in spite of their inhospitable environment and found the cells expressed a certain gene in a way that enabled them to function without using oxygen. Understanding more about the function of stem cells and their ability to self renew might lead to new avenues of encouraging the cells to grow in large numbers outside the body, Dr. Sadek said. For example, a potential bone-marrow donor’s cells could be incubated and grown indefinitely, providing stem cells to be used in multiple transplant therapies. “There have been few studies of the metabolism of stem cells, and our aim was to find out how stem cells can ‘breathe’ and replicate without an oxygen-rich environment crucial for other kinds of cells,” Dr. Sadek said. In addition to being successfully used for bone-marrow transplantation for years, bone-marrow cells are used in hundreds of studies for heart regeneration, he said.